"Mail and Express Building." From King's Handbook of New York City, 1893 edition. 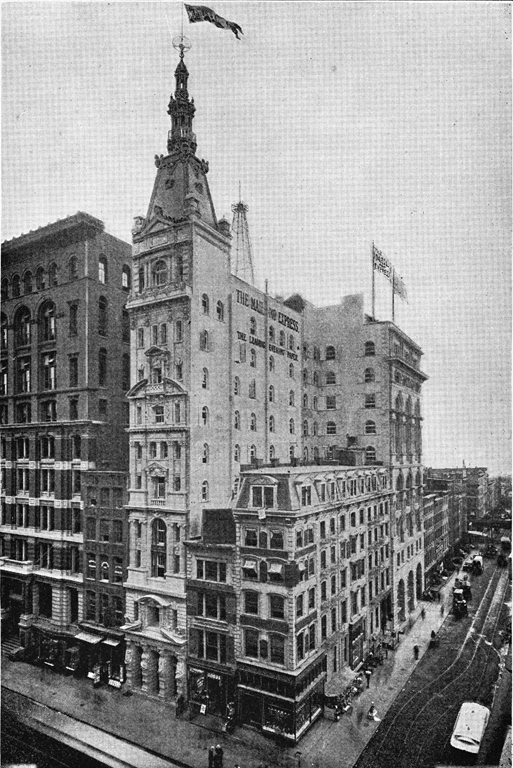 Completed in 1892, the odd skyscraper headquarters of the Mail and Express was an extraordinarily ornate and narrow 14-story slab embedded in a mid-block site, with a main facade on Broadway a mere 21 feet wide. The building was L-shaped, extending 211 feet deep into the lot; a second section on Fulton Street was wider, but only eleven stories. Designed by the Beaux Arts architects Carr�re and Hastings, the Broadway fa�ade had the appearance of the entrance to a French chateau squeezed and stretched vertically and capped with an attenuated mansard tower and spire. The Broadway entrance to the paper's business offices were adorned and overwhelmed by four large caryatids designed by the sculptors J. Massey Rhind and Philip Martiny representing the "four continents." The high degree of sculpture and architectural ornament, also seen in the World Building, seems to have been driven by the desires of the strong-willed client, the publisher Col. Elliott Shepard, who was married to the heiress Margaret Louise Vanderbilt. In 1888, Shepard purchased the newspaper from Cyrus Field, the prominent businessman responsible for laying the first transatlantic cable. An extremely religious man, Shepard included text from the Bible on the editorial page; the paper was politically Republican. The critic Barr Ferree reviewed the building in Stone Magazine, noting that the individual detail of the Broadway fa�ade made a better impression than the structure as a whole. He credited Carr�re and Hastings for doing the best they could under the difficult circumstances of lot size and shape and client demands, noting that, "commercial requirements, however, have little regard for the necessities of the architect." The presses of the Mail and Express occupied the basement and could turn out 98,000 papers per hour. The editorial offices and the composing room were located on the tenth and eleventh floors. Like all the other newspaper buildings of the time, the Mail and Express rented extra floors to tenants; these included technology companies and publishers, such as Electrical Engineer and the American Lithographic Company. The Mail and Express Building survived only until 1920 when it was torn down along with others on the block to make way for the monumental American Telephone and Telegraph Building.